Top row (left to right): 1. Pat Fitzgerald, 2. Marilee Brooks, 3. Ron, 4. Vicki Peterson, 5. Newel Griggs, 6. Ann Schwartz, 7. Scott Sweat, 8. Cathyrn Cooley, 9. Erick Jensen. Second row: 1. Eve Zucker, 2. Rob Newton, 3. Brian Candido, 4. Cindy Foscalina, 5. Tim Meyers, 6. Jill Tarin, 7. Todd Howe, 8. Jill Mattesich, 9. Brent Faulkner. Third row: 1. Don Tirsel, 2. Erika Blunden, 3. Adrian Butterfield, 4. Seth Raymond, 5. no picture, 6. Lynn Bosch, 7. Jeff Holdner, 8. Brent Hales, 9. Keith Huhtala. Fourth row: 1. Miss Croce, 2. George, 3. Kirk, 4. no picture, 5. no picture, 6. no picture, 7. Richard Byrne, 8. Sarah Autrey, 9. Mr Mercy. Credits: From the collection of Rick Byrne. Scanned by Rick Byrne. The Archive has this picture only in JPEG format, as displayed above. If you have a copy of the picture, please submit it to the Archive. 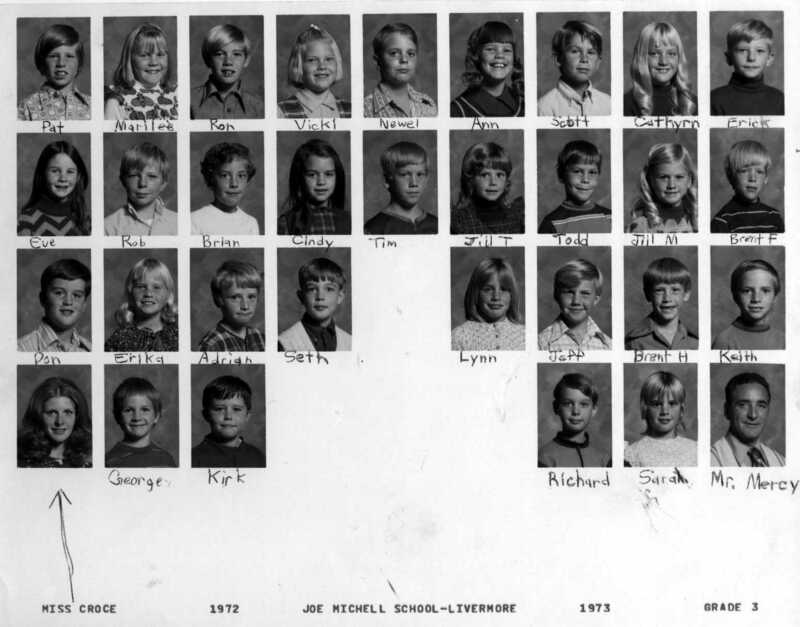 Thanks to Rick Byrne, Kim (Woods) Barry, and Vicki (Peterson) Bischel for identifying the kids in this picture.